We just moved to a new climate 2 years ago, and last year we planted our first plants in the garden. There’s 5 of them. I have a brown thumb. I wanted to hedge my bets. I spent the summer watching my new plants nervously. Watching them, watering them, and waiting for them to die. This might seem morbid, but you have to understand my history with gardens. In the past homes we have lived in, and past climates, I successfully managed to find the plants that would grow best by reading gardening books, asking at Lowe’s, stalking my neighbors’ gardens, and trial and error. I wound up with the most hardy native plants, ones that required little water above natural rainfall, and ones that would survive my gardening ineptness. When we moved to Colorado, I got this book to prepare for another round of gardening failures, and found out…. I had been xeriscaping all my adult life! Excellent. I felt ready. I planted my 5 Russian Sage plants and watched them flourish. Feebly. Then November came, and sure enough, they were dead. I’m going to admit this because its in a blog, and you don’t know me or where I live. Probably. I actually snuck over to a neighboring subdivision and poked into their subdivision entrance display, which back in August I remembered had been chock full of healthy Russian Sage,…. and I broke a plant. (Sorry, HOA people, but I’m sure your plant will be fine, just read this blog post!) I snapped off a section to see if it snapped off just like mine did, and it did. Excellent! I think. I vaguely recalled something from biology class. I’ll share. Dormancy is a temporary state of slowed metabolism. Plants go dormant in response to adverse growing conditions such as extreme heat or cold. They go dormant in response to environmental conditions such as decreased amount of sunlight received in a day and colder temperatures. What causes plants to react this way? Plants have a hormone called abscisic acid (ABA) that contributes to the onset of dormancy. When a plant is subjected to extreme conditions such as falling temperatures, ABA buildup allows the plant to deal with the stress by suspending growth of new foliage (in the vascular cambium, if you’re curious). Abscisic acid levels in a plant are diminished by increased exposure to sunlight, warmer temperatures, and by heavy rains. These conditions usually occur in the spring, of course. Realize too that some winter-blooming plants are dormant in the summer months. In their case, it would be cool fall rains that would trigger these plants to emerge from dormancy in the winter. Plants have an internal clock that helps them remain in dormancy until it is time to grow again. A certain number of cold days is required to break down the ABA within the plant and stimulate growth once more. If there were an unseasonably warm day mid-winter, the plant would remain in dormancy, since its measure of cold days were not yet complete for the season. The levels of ABA differ from plant to plant, which is why some plants tolerate stressors such as cold winters more readily than others. I’m guessing my Cape Blue Plumbago had much less ABA than does my Perovskia atriplicifolia. For now, I think my Russian sage will successfully emerge from dormancy this spring ready for new growth. But I’ll know for sure when it happens. Helpful suggestions? Comiseration? Gardening pointers? Leave a comment! Snow. It’s that time of year. Some of us have received a whole bunch so far this winter, and others… none at all. Still, everyone knows about snow. When it’s warm and the clouds come, it rains. If it gets cold enough… it snows. Snow is the result of the saturated clouds of water vapor whose droplets of water attach themselves to ice particles. They attach and they freeze. Frozen ice particles grow when they encounter more water vapor. Sometimes they mix with other particulate such as dirt, smog, dust. When the frozen ice particles grow so big that their weight is too heavy to be tossed about within the cloud, they fall out of it. Another way to say this is that the fall speed of the ice particle exceeds the upward air drafts within the cloud. Note that for the snow to hit the ground as snow and not rain, the temperature all the way down must be below about 32° F. That snowflake has to stay below freezing or it will turn to rain. Even if it is above freezing where you sit, at ground level, if the majority of the air on the way up to the snow cloud was below freezing, chances are that snowflake will remain a snowflake long enough for it to hit the ground. And the shape of a snowflake? It has six sides, a function of the molecular composition of the snowflake. Snow is water, and the H2O molecule consists of a central oxygen atom with two hydrogen atoms joined to it on either side at 104.5° angles. This V-shape with a negatively charged oxygen atom and positively charged hydrogen atoms means that additional water molecules that attach will do so in a particular shape. A 6-sided one. It follows that larger snowflakes are formed in higher water-vapor conditions within the snow cloud. Smaller more compact snowflakes mean lower water vapor content aloft. As an activity, you can bundle up and head outside and see what shapes of snowflakes you can find. 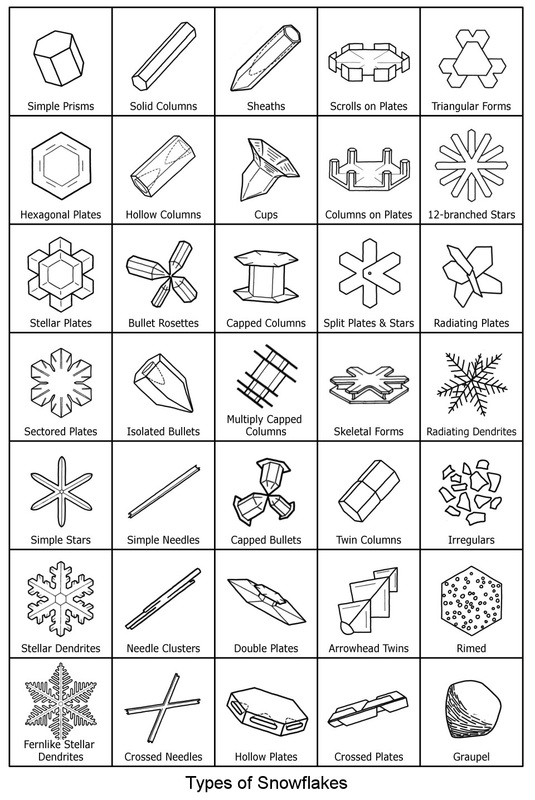 Take this printable resource with you on snowflake types (or leave it inside and come back and refer to it over a hot cup of cocoa). And for more fun activities and resources check snowcrystals.com. For fascinating reading about Wilson “Snowflake” Bentley and his snowflake photography, check out the website here.